Last week, my wife began her morning with the dreaded iphone search. She was certain she had used it and left it in our kitchen. After searching the house for over an hour, she decided to ask our tech-addicted 4 year old. Sure enough - he had used it and knew exactly where it was. He led my wife to our neighbor’s yard, where her new iphone had spent the night. Fortunately, it works great. I’m now a big fan of lifeproof cases and I am hopeful that my wife will begin to use a secure, child proof passcode. 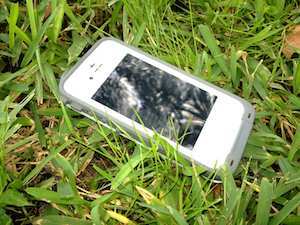 Many people know the uneasy feeling of a lost or misplaced smart phone. This common feeling forces us to recognize the important role these devices have in our lives. Frankly, we are dependent on them. It is now the norm to find both parents and children pass their time in my office waiting room on a smart phone or tablet PC. Often, children are shockingly “skilled” on these devices. It is this observation that led to our smart phone survey. This survey was completed on the babyourself.com website by 110 parents of children up to 5 years old. The survey’s intent was to explore both childrens’ smart phone abilities and how these devices are used within the family. The results provided insight in to the smart phone use of today’s children and parents. Of our survey questions, the ability to “scroll through pictures on a smartphone” was acquired at the youngest age. According to our survey, an amazing 67% of 5 to 8 month olds are able to scroll through pictures. Children seem able to use a touch screen around 12 month old. In our survey, 85% of 12 to 16 month olds can use a touch screen. One hundred percent of children older than 16 months reported the ability to use a touch screen. Seventy percent of 1 year olds and 85% percent of children older than 12 months can “swipe to unlock”. Most children were able to find and start smartphone videos around two years old. In our survey, 57% of 2 year olds and 83% of 3 year olds can find and start videos. This is contrasted by only 29% of 21 to 24 month olds who could perform this task. Two year olds also master the individual devices names like blackberry or iphone. Sixty seven percent of 2 year olds surveyed could says the devices name verses only 42% of 21 to 24 month olds. Several, smart phone tasks were mastered by our 3 year olds. Sixty three percent of 3 year olds can adjust a smart phones volume verses only 24% of 2 year olds. Seventy one percent of 3 year olds can take pictures on a smart phone verses only 33% of 2 year olds. Only 12 % of respondents report their children knew how to purchase apps on their device. Prior to 8 months old, two-thirds of parents reported owning no apps for their child. After 9 months, 92% of parents reported owning at least one app for their child. One third of parents (of children over 8 months) owned more than 10 apps and 12% owned more than 20 apps for their children. 81% of parents report using their smart phone to calm their child when upset. Less than half of parents in our survey use passcode security. Of those who use a passcode, only 15% of their children know the passcode. Hopefully, my story will inspire a few parents to passcode protect or “child proof” their smart phones. I believe that my son took my wife’s iphone, because mine is passcode protected. I take heart in learning that 71% of survey respondents reported their child taking their device without asking. I wonder what percentage of kids can remember where they left the device the next day. Is your child smart phone delayed? In our office, we have seen an increase in the number of children who pass waiting room time playing on an iphone, droid or ipad. I am often impressed with their comfort level and touch screen abilities. What amazes most adults seems natural and innate in toddler’s hands.